This page is to answer your questions about the ASPIRA Athletics Program, provide resources, and give updated information. How old does my student-athlete have to be to participate? As we are part of the Delaware Interscholastic Athletic Association (DIAA), only students in 6th, 7th, and 8th grade are allowed to participate. Does my student-athlete have to pay a fee to be a part of the athletics program? No. 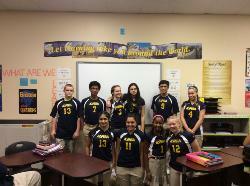 The ASPIRA Athletic Program has done its best to cover most of the expenses such as uniforms and certain equipment. At times, parents/guardians will have to provide certain items, such as soccer cleats or basketball cleats. How will if I know if my student-athlete is prepared for tryouts? Before each new season, the Athletic Director will hold a preseason meeting. Interested student-athletes and their parent/guardians will have the chance to meet the coaches and find out what they need to be season ready. Please check the athletic calendar for dates. What happens if I am late to pick up my student-athlete from practice? After the 15 minute grace period, you child will be sent to the ASPIRA Aftercare Program. You will be charged for at this time, at a rate of $4 per half hour. How can I get involved as a parent/guardian? Parents/guardians can become a part of the ASPIRA Boosters Club, whose goal is to support the efforts of the after-school activities of LAAA. To meet that goal, the ASPIRA Boosters Club will fundraise and run concession stands at the athletic events. If you are interested in becoming involved, please contact Ms. Kathleen Chappel. How do I know if a game was cancelled or postponed? Please check aspiraacademysports.com for the most up-to-date information.